Back in the spring of 2011, I moved to Songtan and found myself curious about this interesting city. Here we had thousands of American military personnel and family members living side by side with Koreans. While I found a lot of information about Songtan online, most was either outdated, subpar, or spread across the far and distant corners of the Internet. I was unsatisfied. As a result of this unsatisfaction, I decided to walk every last street and alley of Songtan from Homeplus straight up to the rural northern boundary fence of Osan Air Base. With paper and pencil, I mapped any and every location of interest, photographed every fascinating corner of town, and then began hiking park and mountain trails, thus mapping them too, all by hand. 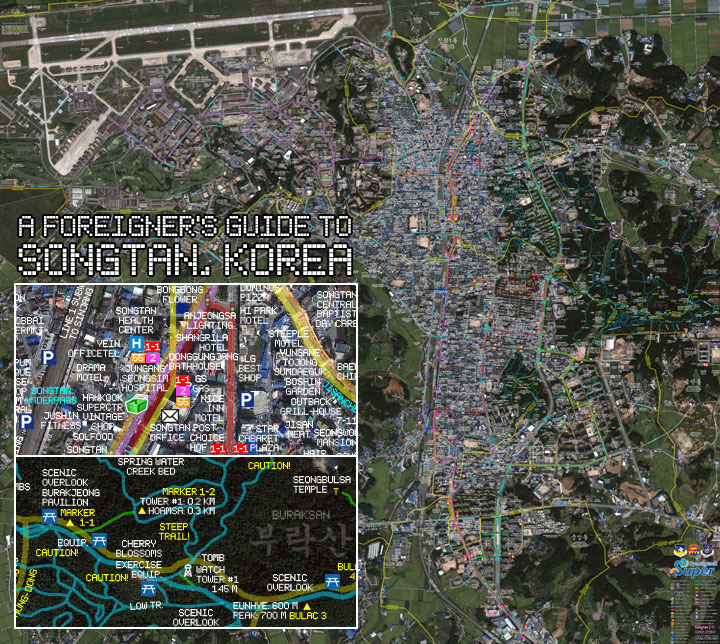 I spent thousands of hours on these projects, not only to keep myself occupied and satisfy my own curiosity, but also to help my fellow foreigners, both those who have lived in Songtan and Pyeongtaek for years and those who are new to town. I hope this project helps those of you who live in the area currently or will in the future. Please feel free to share these maps and visit the other pages of this site for additional helpful information! * Amenities: Cheongsan Badminton Club; toilets are down the stairs and beside the badminton club and at the southern trailhead beside the archery association with additional toilets inside Chorok Library. Dogs are allowed, but only the single main trail on the south side of the park is suitable for dog walking. Gateball is also available here. * Access: Parking is available in the large lot beside Jisan Chorok Library just off Jisan-ro immediately east of the bus terminal and a smaller lot off Songtangongwon-ro between Songtan-ro (Highway Mart) and Gyeonggi-daero, Route 1 (Pyeongtaek Jisan Elementary). Nearby bus routes include: 2-2 - any stop between the main trailhead of Buraksan to the south and McDonald's to the north is within walking distance; and 1-1 - get off at the bus terminal or anywhere between Route 1 and POSCO Apartments. Officially Songtan Park, this Jisan-dong park is also known in some literature as Jisan Sports Park but includes no signage. The park is among Songtan's largest and most centrally-located and is split into two sections by Songtangongwon-ro (Songtan Park Rd. ), both a north and south section. On the park's south end is the archery range of Songmujeong Pyeongtaek Archery Association, while Cheongsan Badminton Club is on its west side. Finished in 2011, a small yet beautiful section of park sits beside Jisan Chorok Library just moments from the bus terminal and overlooks the city's Jisan neighbourhood. At the park's main entrance beside Pyeongtaek Jisan Elementary School is a parking lot and skating rink with exercise equipment nearby. A great place for some peace and quiet, trails here are quite narrow and wind through the woods. Other nearby parks include Songtan Children's Park beside Pyeongtaek Provincial Library, Jisan Children's Park just to its north and connected to the park by a trail, and Jwadong Children's Park near the library. Beopseongsa Temple and POSCO Apartments are in the southwest corner of the park. * Amenities: Toilets were added beside the main parking lot beside Songil Elementary in a late 2012 redevelopment and reforestation project. The Dunggujaebong Mineral Spring, which can be used as a small wash station or water source, can be found at the small parking lot off Route 1 a short drive south of City Hall. Dogs are allowed here and the majority of trails are more than suitable for dog walking. * Access: The park has multiple access points. 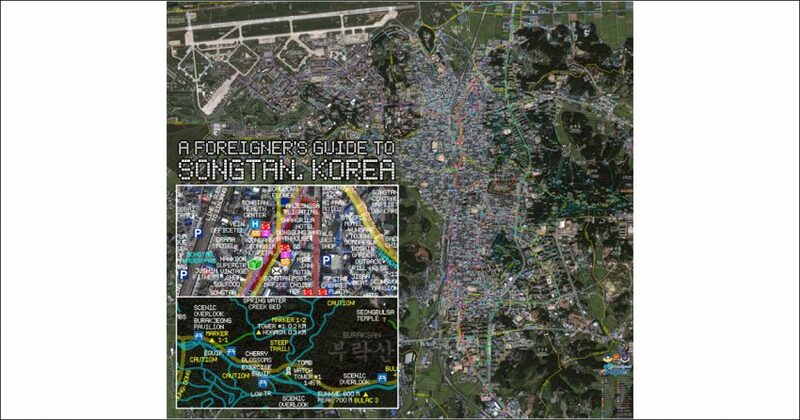 - By car: the main parking lot sits beside Songil Elementary School just east of Songtan-ro's Electronics Land Jct. and north of Lotte Castle Apartments and includes stairs to the monument at its peak. In 2012, a new parking lot was constructed along Songil-ro (just north of the school) just off Seojeong-ro that can accommodate a handful of cars. In addition, a small parking lot can be found off Route 1 at the mineral spring (400 m. / 1,300 ft. south of City Hall on the west side of the road) with a gently sloping main trail to the memorial. The park has direct access from Lotte Castle Apartments via a path from the playground and has limited parking spots along the road to the north of building 105 where a trailhead can be found near a grouping of large tombs. - By bus: take 1-1 and get off just north of Songil Elementary or take the 55마을 and get off at any of the stops in the commercial district between the Culture & Art Center (City Hall) and Songtan-ro. In addition, access is less than a five-minute walk from the Seojeong-dong Nambu Express Bus stop immediately south of Lotte Castle. Known by many names but known officially as Seodumul Neighbourhood Park at the city government level, the hill historically mapped as Dunggujaebong with later mentions of Chunghonsan (충혼산) and is also refered to as Seojeong Neighbourhood Park. The small road Dunggujae-gil runs along its southern edge ("bong" is added to the name, which is used in Korean for large hills as opposed to "san" for mountains) with the Kingdom Hall of Jehovah's Witnesses, the small Uri Church, Sein Hospital, and Lotte Castle Apartments nearby. Along with this road, the hill and park is bordered by Gyeonggi-daero, Route 1 on its east side, Songtan-ro to its west, and the Seojeong-ro commercial district on its north end. The park doesn't have a large number of trails, yet it's still quite easy to find a quiet spot to relax. A main trail runs along the hill's ridge and a grouping of tombs on the east side (just before the exercise equipment and benches) provides a quiet place to relax and catch a view of the apartment buildings of the Ichung-dong neighbourhood. At the northwest end of the main trail is the hill's peak of 89 meters (292 feet), exercise equipment, and a monument dedicated to war veterans. Newly-constructed stairs were added in 2013 connecting the memorial to the concrete walkway leading to the main parking lot and toilets beside Songil Elementary School. Buamsa Temple is tucked away in a quiet section of the park. * Amenities: Buraksan has numerous amenities to make your hiking or exploration more enjoyable. Bathrooms can be found at the north parking lot (see the third note on park access below) as well as in Buraksan Neighbourhood Park beside the health and welfare center. Alternatively, there are bathrooms at Ichung Leports Park. There are no bathrooms available at the main trailhead along Route 1, but there are bathrooms available on the second floor of the Seojeong-dong McDonald's, just a short walk to the south. Food is available from a handful of restaurants at the main trailhead, including Buraksan Boribap (부락산 보리밥, 평택시 서정동 1-2), offering a Korean barley rice dish immediately beside the trailhead, Dayeon Chinese Restaurant across the street, McDonald's, Anyang Haemultang (the giant crab beside McDonald's, 안양해물탕, 평택시 서정동 779-4), and Buraksan Mart, a convenience store. To the south, food is limited to a few convenience stores in the vicinity of Buraksan Neighbourhood Park, Ichung Leports Park, and Kookje College, and the situation at the start of the Buraksan Bike Path along Route 1 is rather similar. There is a Lotte Super supermarket (롯데슈퍼 지산점, 평택시 지산동 631-3) at the trailhead of the park's northernmost extent between Songbuk Elementary and KCC Switzen Apartments. In the area of the northern parking lot and bike path, Wondumakjip (원두막집, 평택시 지산동 536), a chicken restaurant, and Solbatmaeul (솔밭마을, 평택시 지산동 519-3), a barbeque restaurant, both offer Korean-style food with the latter offering a volleyball court. Off the main trail beside the water treatment plant and Sajagol Mineral Spring is a small food tent with a covered seating area that is popular with local hikers and bikers and offers Korean food options. From the main trailhead along Route 1, follow the hill toward the peak and take a left down the winding bike-accessible stairs at the first split in the trail where the tent can be found just beyond the stairs. Those taking the bike path or walking to the main trail's eastern terminus can find a handful of Korean restaurants and food tents at the Heunchi Rest Area beyond the BU-LAC 10 emergency trail marker. Korea's mountain trails tend to be very dusty, especially the light soil found in this part of Korea. To remove the dust and dirt from your shoes, there are two dust removers at trailheads to blow pressurized air on your shoes and clothes. The first can be found at the trailhead along Route 1 with the second beside the bathrooms and health and welfare center in Buraksan Neighbourhood Park. There are two additional devices along the bike path, the first at the start of the path along Route 1 at the bridge and stream and a second at Heunchi Rest Area at the main trail's east end. * Access: Buraksan can be accessed in a variety of ways, though best accessible by bus and car. 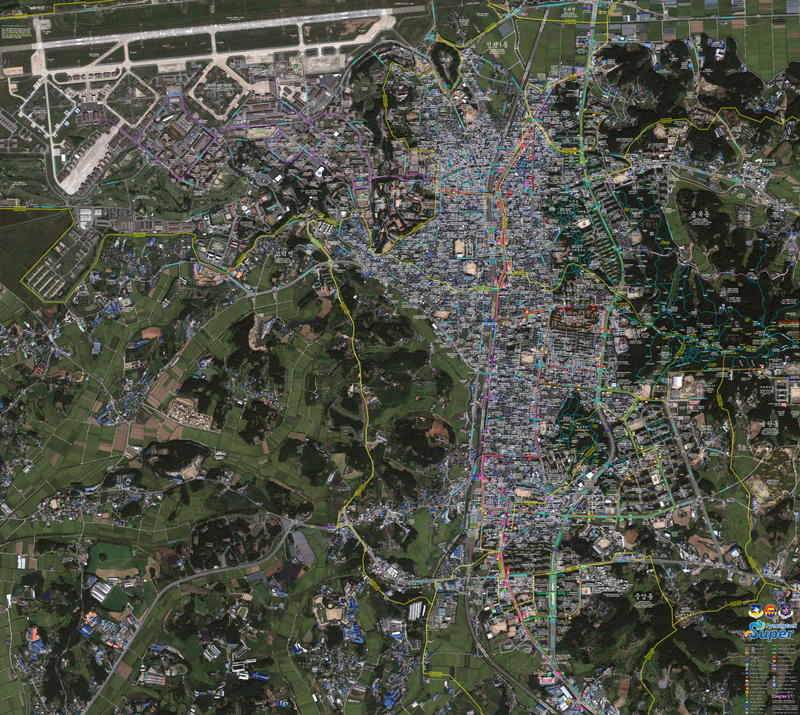 - By car: Buraksan has three main access points by car. 1. On the south side of the mountain, the Ichung Leports Park has a sizable free parking lot that provides easy access to the sports park itself, Buraksan mountain trails, and Buraksan Neighbourhood Park just down the street. Trails connecting to Buraksan can be found starting at Buraksan Neighbourhood Park or just nearby by walking up the hill where the road, Janganut-gil, turns sharply east toward Kookje College. 2. The second parking lot designated for hikers (or at least school overflow parking) is at the Eunhye Middle and High school campus beside Kookje College, a one-minute drive east of the Leports Park. To find this lot, continue straight into Eunhye at the Nambu express bus stop and bus parking lot with the Kookje entrance and welcome sign to your right. Between the middle school and high school is a small drive leading to a parking lot that is often empty. Trail access from this lot isn't especially convenient, so from the lot, walk back around the middle school toward the school entrance where you'll find a trail on your right leading up to a cluster of tombs. Continuing to walk straight, you can take the stairs to the main trail and mountain peak, or take a left at the tombs to follow a lower trail, a duration of five minutes to the main trail and Watch Tower #1. Alternatively, park in one of the lots at Kookje College. Please note that these lots are not recommended on weekdays due to school being in session, but are generally fit to use on weekends or late evenings. 3. The final parking lot (평택시 지산동 519-7) can be found on the north side of Buraksan. The area is more rural and the lot is quiet and unpaved, but it has bathroom facilities and direct access to the Seongbulsa temple (성불사, 평택시 지산동 산132). 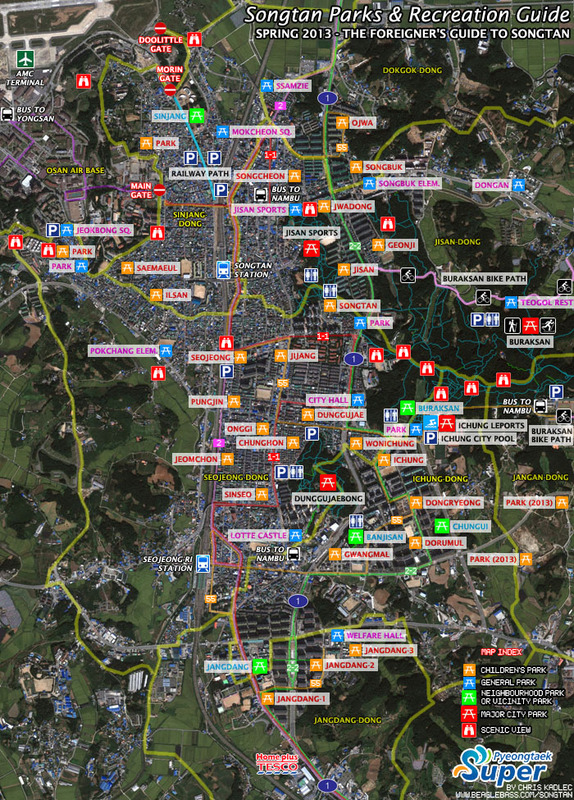 To locate this lot, you must start your trip on Jisan-ro (from Route 1, turn right at the Jisan McDonald's). Approaching from the west, turn right at Grand Sauna, the first light after the KCC Switzen Apartments entrance. Continue along this road, Jisan-ro 140beon-gil, past the church until meeting up with Buraksan Bike Path, which joins from the right side along the stream. Continue straight until the path sharply curves to the left at a small food hut (the Wondumakjip chicken restaurant can be found by continuing to follow the bike path to the left). At the curve, take the smaller path to your right instead and follow it just beyond John's House (요한의집), a handicapped institution, and the Solbatmaeul restaurant, which are beside the unpaved lot. Multiple trails can be found emanating from the lot, but the most ideal can be found by continuing to walk down the remainder of the road past the Seongbulsa temple on your left. A winding set of stairs will take you 3/10 mile (0.5 km.) directly to the main trail and mountain peak. - By bus: Buraksan can be accessed via most major city bus routes. 1. The 55마을 bus stops at numerous access points, including Buraksan Neighbourhood Park and Ichung Leports Park. The bus continues to Kookje College but will make a U-turn at the Leports Park on non-school days unless specifically requested. The 5-1마을 bus follows a similar path to Kookje and can be used as a substitute. 2. Bus 2-2 heading north from Pyeongtaek winds through Ichung-dong before passing the Women's Community Center and Buraksan Neighbourhood Park. Get off here or beside the Culture & Art Center, City Hall, or at the stop immediately across from the Seojeong-dong McDonald's (Jeil Middle/High) on Route 1 to access the main trailhead. To walk the additional trails or the Buraksan Bike Path, use any of the bus stops north of the Seojeong-dong McDonald's up to the Jisan McDonald's. 3. Likewise, take Bus 1-1 from the south and get off at City Hall or the Seojeong-dong McDonald's or from the north, the first stop after POSCO Apartments and former Air Force Village or the McDonald's and City Hall stops on Route 1. * Park Overview: Buraksan Park, a nature park on the east side of Songtan, is Pyeongtaek's largest park. While official park boundaries are undefined to those who use the park, just less than one square mile of land is officially zoned by the city as parkland, while in actuality, the mountain and its trails stretch 1.3 miles (2.2 km.) from east to west and 1 mile (1.6 km.) north to south at its furthest extent. Circling the mountain is the 2.5 mile (4.1 km.) Buraksan Bike Path, which winds around ponds, streams, and ancient tombs while connecting Songtan Middle School at Route 1 to Kookje College on the far east side of town. Buraksan has a single main trail that stretches from its trailhead along Route 1 at Provincial Library Jct. (at the end of tree-lined Seojeongbuk-ro near POSCO Apartments and between Songhyeon Elementary and the Songtan Jeil Middle and High School campus to the north of City Hall) east to its terminus at Heunchi Rest Area along the Buraksan Bike Path. Numerous trails, both wide and narrow, relaxing and steep, meet up with the main trail, the most notable being a parallel trail at a lower elevation and an access trail connecting Ichung Leports Park and Buraksan Neighbourhood Park to the lower parallel trail and Watch Tower #1. The main trail has a few major landmarks, two staffed watch towers among them. The first watch tower is beside the main exercise area at 476 ft. (145 m.), an area that blossoms into hundreds of thousands of cherry blossoms during the one-week spring peak. Just to the east is the second watch tower at the mountain peak, 494 ft. (150 meters). Additional exercise equipment can be found in this area as well with a very peaceful rest area just to the north. The main trail is marked with a series of ten emergency markers courtesy of the Songtan Fire Station starting with BU-LAC 1 near the western trailhead, BU-LAC 5 beside the peak, and BU-LAC 10 near the eastern terminus before Heunchi Rest Area. Knowing this system can help you during emergencies and when you lose your direction. Call 031-119 for help in emergencies and report your nearest trail marker for assistance. Side trails generally cease to the east of BU-LAC 6 where only the main trail continues to the bike path at Heunchi. Beyond Heunchi, trails continue for many more miles across the Eco-Bridge (야생동물이동통로, 0.3 mi / 460 m. east of Heunchi) and east to the peak of Deokamsan in Anseong, 2.5 mi (4.1 km.) east of Buraksan's peak, and ending at the Gyeongbu Expressway across from Anseong Service Area. Seongbulsa, a temple just to the northwest of the mountain peak at the north parking lot, can often be heard throughout the area with its ringing gong and is open to the public and accessible by stairs just off the main trail to the west of the peak. Another temple, Hoamsa, is private as many Korean temples are, off the beaten path, and often guarded by an often-angry dog most would have no desire to encounter. Mineral springs can be found immediately north of Eunhye Middle School along the lowest of the three parallel winding trails. Stairs leading from this specific trail to the mountain peak have long been abandoned and replaced with a new set of stairs immediately to the west, but the springs are a peaceful place and not difficult to locate. If entering from the middle school parking area, take the trail to the tombs and take the first right. A nearby trail at a higher elevation will take you over top of the springs. A second mineral spring, Sajagol Mineral Springs, can be found beside the food tent to the east of the water treatment plant and includes a small resting area with benches overlooking the rice field. It is easily accessible by taking the stairs down from the main trail or heading south from the bike path on the wide trail running alongside the rice fields. Buraksan has a few great spots for scenic views of the Songtan area. Best among them is Burakjeong (also called Palgakjeong or Yukgakjeong), a large two-story pavilion a short 4/10 mi. (7/10 km.) walk from the Route 1 trailhead nearing the top of the hill before the first watch tower. It's impossible to miss. The top of the pavilion has great views overlooking the north side of Songtan including Osan Air Base to the northwest. It's very common to see military choppers and planes flying into the base from this vantage point and the roar of fighter jets can often be heard along the north side of the mountain. It was previously possible to see Seojeong-dong's entire Seojeong-ro commercial district west of City Hall from this point as well, but a handful of pine trees have grown to obstruct this view in recent years as other trees are doing to the aforementioned view to the north. The low trail immediately to the south of the first watch tower has rather great views of the many apartment towers of the Ichung-dong neighbourhood, yet is also obstructed by many trees at times. To the north, the four Metapolis skyscrapers towering as high as 817 feet (249 m.) and 66 floors in height can be spotted 10 mi. (16 km.) to the north in Dongtan on most days from near the BU-LAC 3 marker on the main trail. In addition to the best known section of Buraksan, the northern section of Buraksan trails extends north of Songhyeon Elementary and the bike path allowing an extended walk to KCC Switzen Apartments and is especially peaceful. An open area of large tombs provides a great view of Buraksan to the south from near Songtan Middle School. It's a wonderful place to relax or have a picnic in the warm months. Immediately to the south of the Buraksan Bike Path at its Route 1 terminus are vineyards overlooking Songtan Middle School. * Access: The bike path can be easily accessed at three points, two of them at its start and end and one in the middle. There are additional, though minor, points of access as well. - By bus: By bus, the most easily accessible point of this path is at its Jisan-dong terminus beside Songtan Middle School. From Woosung Apts. Junction on Route 1, this point is very visible, seen from the road as a tunnel of vines beside a stream with the orange steeple of Seongae Church behind it. Bus 2-2 stops right beside it from the north and south. From the south, the stop is shortly after Songhyeon Elementary and the old Sujeongam temple door. From the north, the path is 0.4 mi. (0.6 km.) south of the Jisan McDonald's on the left. The Kookje College terminus can be accessed by the 55마을 and 5-1마을 bus on weekdays (weekends by request). Get off in the parking lot of the Loyalty Center building (충효관) just beyond the campus welcome sign where the buses turn around. The path begins beside the Global Center (국제관) across from the track at Eunhye High School. The Songtan-bound Nambu Express bus also stops at Kookje College after its bus terminal stop and Seojeong-dong stop to the south of Lotte Castle, though drivers are often reluctant to make the extra trip as there are rarely riders to transport after the Seojeong-dong stop. - By foot: The bike path can also be accessed from the Buraksan trails. Taking the stairs down to the food tent and Sajagol Mineral Spring from the main trail (see "Buraksan Nature Park" for directions), continue walking north a few minutes beside the rice field. You'll meet the path beside the stream and a few restaurants. The path can also be accessed at Heunchi Rest Area by walking the Buraksan main path to its eastern end. Make it a full loop by starting the Buraksan main trail at its Route 1 beginnings, hike the full 1.4 mi. (2.2 km.) extent of the trail to Heunchi Rest Area, then head back north under the wisteria tunnel to complete the additional 1.8 mi. (2.9 km) journey to Songtan Middle School. Buraksan Bike Path isn't an especially long walk from start to finish, though there are few options to bail along the way, so beware of this fact before beginning your journey and bring a light if you're closing in on sunset as lighting is very limited. - By car: The bike path isn't as easily reached by car, but options do exist. 1. Parking tends to be rather limited in the area of the trail's Jisan-dong start. The residential neighbourhood beside it is somewhat limited in space, though it's possible, though quite discouraged, to park in the lots at Geonyeong or Woosung Apartments across the street. The best option by car is to park in the Kookje College lot (평택시 장안동 산45) on weekends or in the overflow lot between Eunhye Middle and Eunhye High a moment's drive north of Kookje (see "Buraksan Nature Park" for details). 2. The best parking option, though not particularly at either end of the path, is the Buraksan north lot (평택시 지산동 519-7) between John's House handicapped institution (요한의집) and the Seongbulsa temple (for directions, see the third point under Buraksan Nature Park > Access > By car). This lot allows for easy parking and has bathrooms and a food option, Solbatmaeul (솔밭마을, 평택시 지산동 519-3), a barbeque restaurant. The stairs to the Buraksan main trail are also a short walk to the south beside the temple. To meet up with the bike path from this lot, walk a short distance to the north and take a left toward the Jisan terminus and restaurants or take a right toward Sangol Rest Area, Ugok, and Kookje College. 3. Alternatively, to start in the middle of the path, park along the street or in a largely vacant dirt lot in the village of Ugok. Take Route 304 (Jisan-ro) from the Jisan McDonald's eastward and turn right at the traffic light at the Jisan SK LPG station just after Dongan Village Jct. (동안마을삼거리). At the end of the road, you'll find the start of the path with the Gen. Choi Yurim tomb immediately on your right at the split to Kookje, 1.4 mi. (2.2 km.) from that terminus or 1.2 mi. (1.9 km.) to Songtan Middle School to the right. 4. In addition, a small lot (평택시 지산동 551-16) with enough space for just a handful of cars was recently paved in a project by the city and provides direct access to the dirt trail leading to Sajagol Mineral Spring, the food tent, and main trail of Buraksan. The bike path is just a mere moment's walk from the lot. To find the lot, take Jisan-ro east from the Jisan McDonald's, turn right at the first light east of Koaroo and the KCC Switzen entrance and continue south past the church on the right. The unmarked lot is on the right side of the road along Jisan-ro 140beon-gil beside Buraksan Charcoal Grill (see restaurant details below). Limited facilities, including benches, a bike rack, resting gazebo, exercise equipment, and a water fountain. The rest area is mainly forested but a moment's walk away from two open areas with tombs. It is a short distance east of restaurants and the northern Buraksan parking area. Teogol, the next rest area, is 3/4 mile (1.2 km.) to the east. Limited facilities, including sixteen benches, a bike rack, resting gazebo, exercise equipment, and water fountain. The rest area is forested on one side and open on the other. K2 Restaurant (케이투레스토랑, 평택시 지산동 246-4) can be directly accessed across the path from the rest area. Teogol is only 1/3 mi. (500 m.) north of Heunchi Rest Area, so if you're heading east and south from Jisan and Ugok and using the bathroom is your priority, continue onward to Heunchi. Heading in the Ugok and Jisan direction from Kookje, the next rest area is Sangol, also with limited facilities, 3/4 mile (1.2 km.) to the west. Full facilities, including a map, benches, bike rack, resting gazebo, exercise equipment, water fountains, men and women's bathrooms, and sometimes food booths. A handful of restaurants can be found just to the south where the Kookje College terminus is just a brief walk away. This rest area is used by hikers coming from Buraksan to the west and Deokamsan to the east and marks the eastern end of the Buraksan main trail. Heading north on the bike path, the Buraksan trail is on your left at the rest area (the peak is a half mile, or 0.8 km. to the west). Traveling south on the bike path from the Jisan-dong terminus and Ugok direction, the main trail is on your right just after the wisteria tunnel with the Kookje terminus 1/3 mi. (500 m.) to the south. * Path Overview: Running in a 2.5-mile loop around the north and east side of Buraksan and connecting Songtan Middle School to Kookje College, Buraksan Bike Path is Songtan's only designated bike path. The path is almost entirely rural, running through the forests, rice fields, and beside private residences in Jisan-dong and Jangan-dong, and is fantastic for those hoping to take a peaceful ride or walk through the countryside while still having nearby services available. The path starts in Jisan and continues to Kookje College with the small village of Ugok at the halfway point. From the Jisan entrance along Gyeonggi-daero, Route 1, beside Songtan Middle School, walk beside a small stream. There is a bike rack here along with a dust remover for those leaving the Buraksan trails. Just after starting, vineyards can be seen on the south side of the path across from the school and beside a trail connecting to the Buraksan trail network. As the trail enters a forested area around its first sharp curve, you can stop and check out the many Korean carved wooden totem poles (called "jangseung" or "beopsu," shamanistic village guardians) at a house along the path. Just after this as the path curves back to the left is a main trail crossing the stream on the right, which leads to the mineral spring and main trail of Buraksan. In this same area is a grouping of small eateries along the road heading south from Grand Sauna and KCC Switzen Apartments. Among them is Buraksan Charcoal Grill (부락산숯불구이, 평택시 지산동 529) which the bike path passes behind but can be reached by meeting up with the road just after and walking to its front entrance beside the small aforementioned paved parking area, and Hwanggu (황구, 평택시 지산동 541), offering soups and stews, which is along the north side of the street just diagonal to Buraksan Charcoal Grill to its immediate east. From the path's Jisan-dong start, both restaurants are to the left a moment's walk east of the totem poles. After this area, the path turns quite rural. Continue following the old blue signs to Buraksan, often signed with its old pre-2000 transliteration of "Purak Mountain"; the bike path never leads to Buraksan, but is signed as such and will keep you on course with no unnecessary dead-end detours. Additional new signage installed by the city in late 2012 is of better assistance. The path takes a sharp left (continue straight at the curve to access the north parking lot of Buraksan at John's House handicapped institution (요한의집) and Solbatmaeul restaurant). Before reaching pine needle-covered Sangol Rest Area is Wondumakjip (원두막집, 평택시 지산동 536), a chicken restaurant, up the driveway on the left. Immediately after Sangol, which has limited facilities, check out the open area with tombs and interesting stone markers. Continuing onward, the path enters fields and runs behind private residences until it reaches the tomb of General Choi Yurim (1426-1471) with a historical marker in both Korean and English. Just after the tomb, the bike path splits. Take a right toward Kookje College, 1.4 mi. (2.2 km. ), or take a left to the village of Ugok, just a few seconds away on foot. Ugok is a quaint small rural village and is a nice area to briefly explore. Nearby to the west is Ugok Village Country Homes (우곡전원주택), a suburban American-style subdivision, with Dongan Village (동안마을, 평택시 지산동 1247), an impressive new solar panel-powered subdivision, just to its north, worth a side trip if you have the time. To find the subdivision, take the path and road from the tomb into Ugok Village. At the Jisan-ro stoplight and Jisan SK LPG station, take a left. Just to the right of the SK LPG station is Gaetbeol (갯벌낙지요리전문점, 평택시 지산동 311), an octopus restaurant. Back on the bike path at the Gen. Choi Yurim tomb, there is very little of interest heading in the direction of Kookje College. For bikers, this is a good point to turn back to Jisan-dong via the path or else take Jisan-ro back to the area of KCC Switzen, Seongbuk Elementary School and Jisan McDonald's and even south to the Jisan terminus of the path if desired. For those interested in continuing on, the trail winds through open fields, turns south, and soon meets up with the Teogol Rest Area. Teogol has limited services, but K2 Restaurant (see details above under "Teogol Rest Area") can be found on the opposite side of the path. Just 1/3 mile (500 m.) to the south is a wisteria tunnel much like at the start of the path at Jisan-dong, and Heunchi Rest Area immediately after, where paths from the Buraksan main trail and peak meet those with Anseong's Deokamsan to the east. Heunchi has full services, which includes bathrooms. A few restaurants can be found immediately to the south before reaching the Kookje College terminus just an additional 1/3 mile (500 m.) beyond the rest area, including Sanmaeul Myeongga (산마을명가, 평택시 장안동 92-3) and just beside it, the smaller Sanirang (산이랑 시골보리밥집, 평택시 장안동 92-4) a boribap (barley rice dish) house. This part of the bike path is accessible by car, so parking is also available at these restaurants. After reaching Kookje College, it's possible to continue walking or riding through Songtan back to the Jisan-dong terminus of the path by taking Janganut-gil from Kookje to Ichung Leports Park, taking a right at the Leports Park entrance and continuing past Ichung Fountain Park and Buraksan Neighbourhood Park, the Health & Welfare Center, and Culture & Art Center to Gyeonggi-daero, Route 1. Take a right (north) on Route 1 and follow it to the Jisan-dong start of the path, a route that includes 1.9 mi. (3.1 km.) through town for a total loop of 4.5 mi. (7.2 km). It's also possible to walk through Fountain Park and into Buraksan Neighbourhood Park, take the trail up the hill to the Buraksan main trail, take a left, and then follow the stairs down to the mineral spring and food tent straight north to the bike path itself near the restaurants and small paved lot. Perhaps best known locally for its role in the 2013 film "Holly" (홀리), starring actress Jeong Ae-yeon (정애연), Sinjang Neighbourhood Park is the city's northernmost park of its size. While established in 1987, the park wasn't developed and constructed until 2010, opening with the Songtan International Community Center (송탄국제류센터) the following year, which includes convention halls and a multi-purpose wing. The park has exercise equipment, a sports court, bathrooms, a large skating track (others can be found at Ichung Leports Park and Jisan Sports Park), a playground, performance facilities, and is often host to local area festivals, such as the Korean-American Friendship Cultural Festival (한미 친선 문화축제), which takes place each autumn. The park includes the Sindang 1-dong Community Center on its south end, overlooks beautiful Songtan Catholic Church, and is bordered by Sinjang-ro and the Osan Air Base ammunition dump on its north end. Running along the road to the park's west is the former railroad tracks, the southern half of which is now a walking and biking trail. The tracks, which originate across from the BX Mall along Broadway and continue to Morin Gate, then south past the Sinjang Shopping Mall pedestrian road to Sinjang Overpass, serve as a popular route to the park. The park is most easily accessible by car or by foot. There is a large parking lot on the park's west side immediately south of Morin Gate at Alaska Rd. and Sinjang-ro. Doolittle is a short drive to the north. By bus, take the 1-1 or 55마을 bus to their Main Gate stops or the 1-1 and 2 bus stop by Woori Bank south of the Songtan Police Box, post office, and Songbuk Market on Tanhyeon-ro and take the pedestrian tunnel under the tracks to connect to the Sinjang Shopping Mall area, following the old rail path north to the park. The neighbourhood is the setting for the film "Holly," where the playground, convention hall, railway path, Morin Gate, and the Sinjang Shopping Mall are featured as a backdrop along with nearby Taegwang High School beside Songtan Station. Jangdang Vicinity Park, technically a neighbourhood park, stands apart from its three smaller counterparts, Jandang Children's Park 1, 2, and 3, scattered nearby around the neighbourhood. This park is on the north side of Jangdang Elementary School and diagonally across from Hyomyeong Middle and High schools (the campus of which is absolutely worth exploring on a national holiday or weekend when school isn't in session). The park has few facilities aside from bathrooms, some exercise equipment, and a playground, but is a popular open space for those living in the nearby Jeil Apartments and Hankuk Adelium to relax on a nice day as well as students from adjacent schools. The park can be easily accessed by bus or on foot. Most major bus routes pass by this park. From the south, use the 1-1 and 2 bus stops at Jangdang Elementary, immediately after Homeplus, after walk a moment to the north. From the north, the same buses stop just to the park's north at the Agriculture & Fishery Marketing Center (supermarket) or in front of Hyomyeong. The 55마을 bus stops in front of Jangdang Elementary coming from the east and Hyomyeong coming from the north, while the 2-2 bus stops at Jangdang Elementary one stop north of Homeplus from the south and immediately after turning off Route 1 from the north. By foot, take the pedestrian bridge from Jangdang Middle School over Gyeonggi-daero, Route 1, and the Jungang Tunnel entrance. The bridge connects Jangdang-2 Children's Park to Jangdang Vicinity Park. At a height of 246 ft. (75 m.), Banjisan Neighbourhood Park, formerly Dolsan (돌산), is among Ichung-dong's finest hidden parks. The park is accessible from its north end by stairs and a winding path starting at its bathroom facilities bordered by the shopping loop anchored by GS Supermarket in its center. From its south end across from Ichung High School and beside the old Sookmyung orphanage and Banji Village Nursing Home, a long staircase rises to the hillside, followed by a short path and then another hundred stairs back down to the main section of the park. The park includes exercise equipment, a playground, a recycled rubber surface making it popular with sports and picnics on weekends, and is circled by a track for walking or jogging. Many food options are just a moment's walk to the north. Because of its proximity to the school, it is sometimes a hangout for students but is more difficult to access from its south end, so remains relatively quiet. Because of the nearby orphanage, children are common, but not often in the park. The original orphanage building beside the stairs near the high school is the only remaining original building in this neighbourhood when its rural surroundings were swallowed and reconfigured by what is now Ichung-dong in 2004. The remaining part of the neighbourhood, the high school included, would not come into existence for another four years. After monsoon season, the southern access can be entirely overgrown and inaccessible if city workers don't regularly trim the shrubs. The park is typically lighted, though these lights are not always well-maintained. Wildlife, such as raccoons and a turkey are sometimes heard or spotted here. The park has a beautiful pond and waterfalls (which turn on only occasionally) across from the school in the park's southeast corner. In addition to Banjisan, Dunggujaebong, a much larger city park with hiking trails, is immediately across Route 1 with trails starting beside the Kingdom Hall of Jehovah's Witnesses. Cross the road near the park bathrooms and S-Oil. To find this park, take the 2-2 bus to the Pyeongtaek Hospital (former Mediwell Hospital) stop across from Ichung High just after turning east off Route 1 or the 55마을 bus stop just north of the school at Jeongam Village near the Paris Baguette and Dunkin Donuts. Just to the south of Ichung Leports Park, Chungui Neighbourhood Park serves the residents of the Chudam Village apartments complex to the south and Banji Village to the north. The park is rather small and almost entirely forested. Some playing courts are centered between the apartment complexes on the park's west side with bathrooms beside them. A few forested trails, a stream, and small foot bridge run through the park with a resting area and the Chunguigak historical site on its east end bordered by Chudam-ro. The park can be easily accessed by the 2-2 and 55마을 bus routes by getting off in the area of Ichung Middle School (2-2 and 55) or two stops east of Jinro Mart just after Songtan High School (2-2 only). Two children's parks - Dorumul and Dongnyeong, are within close walking distance along with Banji Elementary, Ichung Middle, and Songtan High School. In addition to this beautiful historical site is the Dongnyeong community water well just down the road. The well is still active and used by the village residents and dates from the Three Kingdoms and Goryeo era. From the park, walk north along Chudam-ro to the first stoplight at Dongnyeong-gil, which is on the east side of the road between the church and Songtan Screen Golf. Walk just down that road and the well is easily visible on the right side after Leaders Kindergarten. The neighbourhood park on the city's far eastern extent is the city's newest park. While officially established by the city zoning commission in 2005, the park was not opened until late 2013 as part of the newly-completed 25-tower Jangan Kolon Hanulche Apartments complex. The park lies on the southwest corner of the complex with a children's park on the northeast corner. Exercise equipment, bathrooms, and an area for relaxation are included in this new park. Buraksan Neighbourhood Park has two sections, the original Ichung Fountain Park, and the park immediately to its north, Buraksan Neighbourhood Park. The two parks - the original and new park - are side by side. Because of this, they are often referred to by multiple names, including and all-encompassing Ichung Fountain Park, Buraksan Fountain Park, or Buraksan Neighbourhood Park. At the city government level, the park is similarly referred to rather ambiguously. Ichung Fountain Park was constructed at the same time as construction began on the southern half of Ichung-dong in 2003. The park opened in 2004, not long after Ichung Leports Park just down the street to the east. The park has a large circular in-ground fountain that can spray 15 to 20 feet into the air. The fountain officially operates from April 1st to September 30th twice a day for one hour, though it's exceedingly rare to see it in operation aside from during special events. A large arch separates the original fountain park from the newer neighbourhood park. While the northern half of the park, Buraksan Neighbourhood Park, always had land set aside, it wasn't until early 2011 that the park was finally developed and open to the public. Further development led to a late 2011 opening of the stage in the center of what is mostly an open area of the park. The furthest northern extent of the park was entirely deforested and redeveloped around this same time with new trees planted and a new trail leading from the park's northern edge to the main trail of Buraksan, just a short and easy hike up the hill. The newer part of the park also has an ecology pond, an artificial stream that is popular for swimming on hot days, a resting area, and the outdoor stage. In 2014, the Pyeongtaek Rock Festival (평택 록 페스티벌), which was previously held down the road at the Ichung Leports Park in past years and drew as many as 30,500 people, moved to this stage. Between the two parks, there are two bathrooms. Two major trails connect to Buraksan's main trail, the aforementioned trail starting at the northern extent of the park and another off the northwest side of the fountain park beside the bathrooms where a dirt and dust remover can be accessed. In addition, a new trail entrance and stairs were added during a 2013 redevelopment project to the east of the fountain park. Buraksan Neighbourhood Park can be easily accessed by foot, car, or bus. By foot, the park can be easily seen from the Buraksan main trail between the BU-LAC 1 and 2 markers west of the Burakjeong (pavilion). Use the trail to descend into the park. The park is also a short walk east of the Leports Park. By car, park down the road at the Ichung Leports Park, which has 142 spaces, or just to the west of Fountain Park at the parking garage (fees apply) of the Songtan Health & Welfare Center, which opened in late 2012. By bus, take the 2-2 bus and get off at the Women's Community Center across from the park entrance or the next stop beside the Culture & Art Center. From the opposite direction, the stops are immediately after City Hall. Additionally, the 55마을 bus passes the park twice. Heading from the south toward Kookje College, get off across from the park or just before or after the park on the way back into town. The 1-1 bus passes nearby with the City Hall stop just a short walk around the corner. * Park Overview: Ichung Leports Park is the city's only designated sports park. Lying on the far east side of Songtan between Buraksan Neighbourhood Park and Kookje College in the city's newest neighbourhood of Ichung, the park includes many facilities for sports, exercise, performances, and relaxation. The park holds yearly and seasonal festivals, including the Pyeongtaek Rock Festival (which recently moved down the road to Buraksan Neighbourhood Park), and hosted the 2012 Asian Weightlifting Championship. To its north is Buraksan and to its south is the World Mission Society Church of God. For a nice scenic view toward Pyeongtaek, take the road up the hill to the back side of the Culture & Sports Center and look south. * Access: The park can be easily accessed by foot, car, and bus. By foot, the park is immediately to the south of Buraksan. A trail just east of the first watch tower and exercise equipment leads down to Buraksan Neighbourhood Park and the Leports Park. It's also less than a five-minute walk east of Buraksan Neighbourhood Park (and Ichung Fountain Park). By bus, take bus 2-2 from the south and get off one stop after Ichung Elementary School at the Women's Community Center across from Fountain Park. From the west, the stop is just after City Hall and the Culture & Art Center. The 55마을 bus can be used as well (along with the 5-1마을 bus heading to Kookje). Get off across from Fountain Park or at the entrance of the Leports Park itself. Unless a stop is requested, most buses turn around here instead of going to Kookje College on days in which classes aren't in session. By car, the park can be easily accessed from Route 1. Coming from Pyeongtaek: after Homeplus, take the Jungang Tunnel. Turn right at the second traffic light (Culture and Art Center Jct.) just before City Hall. Follow Seojeong-ro to its end. From the north, turn left at the first light after City Hall and Gwangwangteukgu-ro (Tourist Street). The Leports Park has two lots with a total of 141 parking spaces, typically enough on an ordinary day. * Facilities: The Leports Park (a uniquely Korean term for "leisure sports") has the following facilities: a large soccer (football) pitch, a volleyball court also suitable for foot volleyball, two basketball courts, a outdoor futsal pitch, seven badminton courts, seven tennis courts (5 dirt, 2 solid surface), a large inline skating track (others, though smaller, can be found in Jisan Sports Park, at Sinjang Neighbourhood Park, and just down the road at Ichung's Dorimul Children's Park), a winding walking and running trail, playground, bathrooms beside the park office, and the three-floor Ichung Culture & Sports Center (이충문화체육센터), which hosts stage facilities and basketball courts on the ground level with 1,995 grandstand seats and two swimming pools in the basement, a 10-lane 30-meter adult pool and 3-lane 30-meter children's pool accessible by the front building entrance or the basement stairs entrance on the west side of the building, as well as a handball court. To the Sports Center's east is a private badminton gym. * Fees: Tennis courts are fee-based: 25,000 won per month or pay by hour, 1,000 won daytime or 2,000 won for nighttime matches. The soccer pitch can be rented for athletic games for 30,000 on weekdays and 40,000 for weekends and public holidays or for athletic competitions and other events for 100,000 on weekdays and 150,000 for weekends and public holidays. Call 8024-6301 (송탄출장소생활지원과) for details. Additional fees may apply, such as stadium lighting (10,000 per period) or performance lighting (25,000 per hour), among others. For pool fees, see below. * Swimming Pool: The pool is in the basement of the Culture & Sports Center and can be reached from within the building or the outdoor pool entrance on the building's west side. It is open from 6:00 to 21:00 (and has in the past closed an hour early from November to February), but closed on Mondays and public holidays. For open use of the pool, which includes one day of use, charges are as follows, for Korean age (살): 3,300 won (19-60 years old), 2,200 won (61-64 years old), 2,200 won (school students, mandatory Korean military or police students), or 1,650 won (elderly, children, and the disabled). For monthly membership, which includes class members or general membership: 66,000 won (19-60 years old), 44,000 won (61-64 years old and school students, mandatory Korean military and police students), and 30,800 won (elderly, children, and the disabled). Women ages 13 to 55 get a 10% discount on monthly membership. Fees may change and are current as of 2014 for the Ichung pool as well as the Hapjeong and Anjung pools. - The daybreak class (새벽반) from 6:30 to 7:20, open to all levels, adult males and females, with a maximum of 20 enrolled students. - The housewife class (주부반) from 10:00 to 10:50, open to all levels, adult females only, with a maximum of 20 enrolled students. - The children's class (어린이반) from 16:00 to 16:50, open to elementary students, both boys and girls, with a maximum of 20 enrolled students. - The evening class (저녁반) from 19:00 to 19:50, open to all levels, adult males and females, with a maximum of 20 enrolled students. * Affiliated park management: Pyeongtaek Tennis Association (평택시테니스연합회) and Pyeongtaek Badminton Association (평택시배드민턴연합회). * Location: Beside Hanil Apts. * Location: Center of Kolon Hanulche Apts. * Location: North side of Jeil Apts. * Location: South side of Lotte Castle Apts. * Location: South of The Sharp Apts. Jct. * Location: East side of POSCO The Sharp Apts. * Location: Northwest of Lotte Castle Apts. * Location: Southeast of Sinjang Neighbourhood Pk.